Hello! What is the brand/mill? I need to see this envelope to know color and feel. My client wants navy. If you can send me the brand, I may have paper samples to review. Otherwise, can you send me a sample? You're looking for large but you want symmetry. You're looking for a great color that will appeal to all, but you want to be different at the same time. Well, you've came to the right page alright! 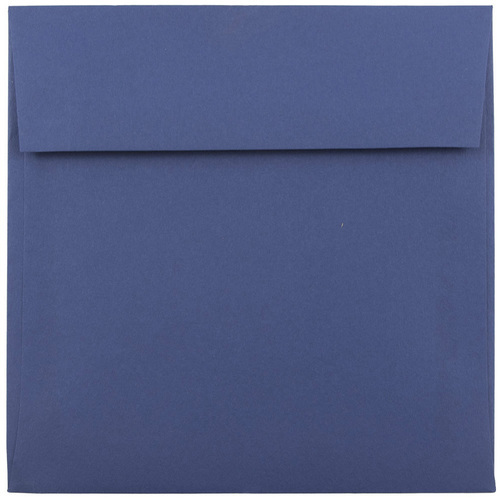 These large Blue 8 1/2 x 8 1/2 Square Envelopes are the cream of the crop when it comes to our larger sized square selection! Perfect for 8 x 8 sized invitations, greeting cards, letters or pictures. The square shape will catch the attention of anyone, especially with their boring rectangular bills and letters they receive. And with a variety of blues to choose from you can be certain to stumble across a shade that works for you. From winter events to baby showers, our blues have got you covered. And since most of our selection of Square 8.5 x 8.5 Envelopes are translucent, your content is sure to be unique! These Blue Squares measure in at a whopping 8 1/2 x 8 1/2 and feature a rectangular gummed flap closure. Available in 7 different shades, so start browsing today!